A 26-year-old man has been accused by police of starting a fire and causing significant damage in the men's restroom at the downtown Anchorage bus depot this week. 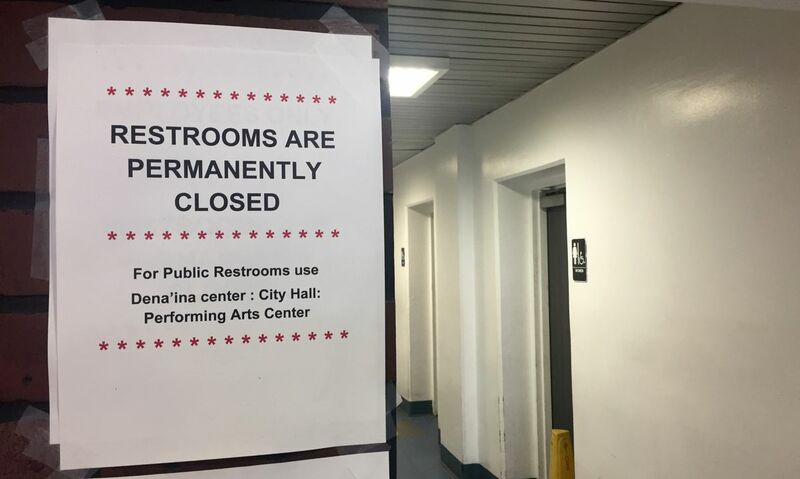 Officials have since closed off the transit center restrooms entirely, removing one more public bathroom from downtown Anchorage and highlighting a persistent problem for the city. Just before 8 a.m. Wednesday, someone called 911 to report smoke at the bus depot, said Jodie Hettrick, deputy chief of operations for the Anchorage Fire Department. People evacuated the building. Andrew Halcro, the executive director of the Anchorage Community Development Authority, the city agency that owns the center, said the fire apparently started near the bathroom sink. He said his staff suspected hand sanitizer had been set on fire. He said the full cost of the damage wasn't yet known. But he guessed it would rise into the thousands of dollars. "There was soot all over the place, the mirror is broken, the whole vanity is trashed," Halcro said. Now signs in front of the cordoned off hallway declare: "Restrooms are permanently closed." The signs direct people to the Dena'ina Center, City Hall and the Alaska Center for the Performing Arts, all a block or more away. "It's an inconvenience, but there's not much we can do when people resort to arson," Halcro said. Halcro said security cameras took a photo of the suspect, which was then turned over to police. About 11:30 a.m. Thursday, a security guard called police to say the suspected bathroom fire-starter was at the bus depot, said MJ Thim, spokesman for the Anchorage Police Department. Police showed up and arrested Rigoberto Walker, 26, at the transit center. Walker is being charged with felony arson, according to Thim. His first court appearance was scheduled for Friday afternoon. About 20 people were standing or sitting inside the center late Friday morning. One man waiting for a bus said he'd heard someone had tried to burn the restroom down. The sudden lack of restrooms was "no biggie," he said. People could go elsewhere in the neighborhood. The transit center restrooms were on track to be permanently closed sooner or later. Much of the building is expected to be turned into a hotel and apartments. The city's transit agency will take up a dramatically smaller part of the building after the renovation is complete. Half of the building has been boarded up. Businesses, nonprofits and food vendors that used to be inside the center have all moved out. With the building empty of food services, Halcro said, the transit center no longer had a legal obligation to provide restrooms. But he said his agency did want to keep the restrooms open. He said the scarcity of public restrooms downtown is a real issue for tourists in the summer and the city's homeless population. "We can't have people taking care of their business in stairwells and elevators and behind people's places of business," Halcro said. On the other hand, he said, he found himself standing in the ash-covered bathroom in the transit center at 8:30 a.m. Wednesday thinking about how much money it would take to fix it. Public restrooms don't make money, said Halcro, the former president of the Anchorage Chamber of Commerce. Who pays for, maintains and cleans the facilities are all difficult questions, he said. He said he's researched options in other cities. Most downtowns struggle with it, he said. 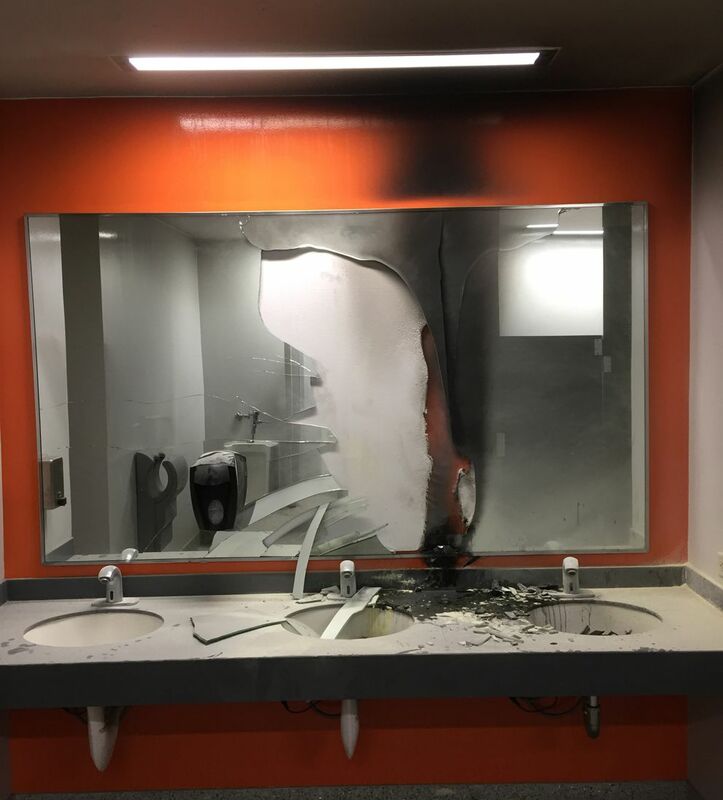 To underscore maintenance and security challenges, this week's restroom fire happened just steps away from the transit center's security office, Halcro said. "We've got to create that balance where you're providing facilities, but not so that private enterprises are suffering thousands of dollars in damages because they're providing a service people need," Halcro said.